With 2 built-in tree stands with food plots, gated road front entrance, and a road system in great condition throughout the property, this tract would make a great hunting retreat. Located on Highway 11 near Penderlea in Pender County, North Carolina, this secluded property would make an ideal hunting tract or timber investment. The tract is located only 30 minutes from Wilmington, off US 421, in an area known for its trophy size whitetail deer. The area also provides hunting for the occasional bear and other small game, such as, turkey, squirrel, raccoon, or dove. The property is surrounded by several hundred wooded acres which helps provide such great hunting. There is no dog hunting on the adjoining acres, so one may not hear a dog running the entire hunting season. The property provides road frontage with a private gated entrance. It offers an excellent road system ditched on both sides with Bahia grass planted. Two built hunting stands are already on the property over two cleared food plots ready for hunting season. There is a cleared area on the property perfect for a small cabin or just a place to camp while at your own hunting retreat. The timber can be allowed to grow for future income or you could cut and chip timber and manage the timber more intensively. If you choose to cut the timber, you could also clear cut more areas for food plots. Call to set up your appointment and secure your hunting land for the next hunting season. For a bird's eye view of this property, visit our MapRight mapping system. Copy and paste this link into your browser mapright/. com/ranching/maps/69d967d67aeca5f25f3cb8857bc13e34/share. This interactive map allows you to easily change the base layers to view aerial, topographic, infrared or street maps of the area. Let , a Certified Land Specialist with Mossy Oak Properties/NC Land and Farms, connect you with the right piece of property that will fill your dreams and inspire your imagination. If you are looking to buy rural land in North Carolina or South Carolina, then working with is the natural choice. I love working with rural land, and I want to help you discover the unique bond with the land and its wildlife that only comes with owning your own fist full of dirt. 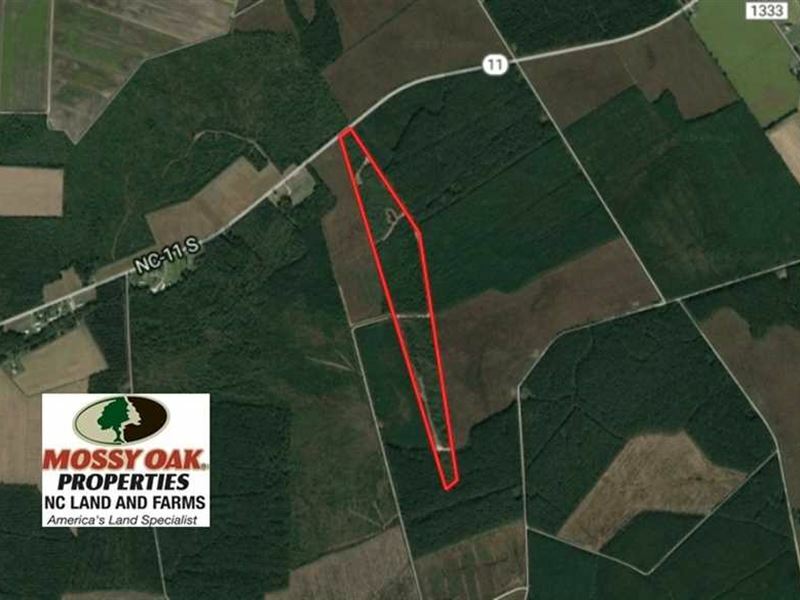 For more information on this and other Hunting and Timber Land for Sale in Pender County NC, contact at , by email at Email listed above, or visit our web site at Web Link listed above. Bud at Email listed above, or visit our web site at Web Link listed above.